This is the second part of our Frugal Holiday series. 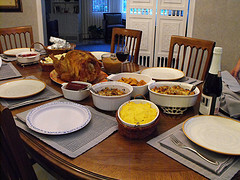 In the first part last week, we talked about frugal holiday entertaining. If you are cooking the big holiday meal in your family, you probably don’t want to forsake food quality for frugality… but you also don’t want to empty out your bank account for just one meal. Luckily, frugal food serving doesn’t have to be an either/ or proposition. You can serve a great meal complete with appetizers and dessert without breaking the bank—but you may have to break a bit of a sweat. 1. Keep it simple: There is no need to create complicated, multi-layered appetizers. Instead opt for simple foods like cheeses, olive assortments, raw vegetables, crackers and dips. 2. Make it fun: No one can resist a bowl full of assorted nuts in the shell and cute holiday nutcrackers. Nuts can get expensive, so it is important to not overbuy and make sure you buy the assorted bags instead of all one kind. Your guests can then choose those nuts they most enjoy and have fun trying the others. 1. Cook it yourself: I know if can be tempting to call up a company that specializes in preparing holiday meats and buying a premade ham or turkey from them, but if you prepare the food yourself it will be much less expensive. 2. Buy enough but not too much: There is no point in having enough food to feed an army unless you are, actually, feeding an army. Instead, buy just as much bird or ham as you need. Remember, sending people home with leftovers is nice, but it increases your expenses and if you keep all the leftovers, you may end up wasting them. 1. You can’t please everyone: Chances are that each member of your family loves a different traditional side dish and expects you to have all of them. It’s not practical to serve ten different side dishes when three is more than enough. Let everyone know which side dishes you plan to serve and that if they want one you are not preparing, you’d be happy to make a place for it on the table if they decide to bring it. 2. Everything is interchangeable: The more ingredients your meal needs, the more expensive it will be. Your gravy can be made from the turkey, your sweet potato casserole ingredients can be used in your sweet potato pie dessert, and your raw veggie appetizers can also be steamed for a healthy side dish. Try to plan your menu so that you have only a few main ingredients to stretch out over several parts of your meal and you don’t have a ton of left over ingredients sitting in your fridge untouched for a year. 1. Pick one: You don’t need to have every variety of pie under the sun at your table. Choose one kind of pie and serve it. 2. Just one alternative: For those guests who don’t like pie or want something lighter, you might consider making some cookies. Not only will this make a nice and affordable alternative for non-pie eaters it will also offer something easier to snack on if your guests stay late. Another good idea is to check your kitchen prior to going grocery shopping so you don’t buy something you already have.